NAMI NJ founded the Expressive Arts Network in 1993, spearheaded by the late Dara Axelrod, to encourage self-expression, personal growth, networking, advocacy and the understanding of how artists affected by mental illness have contributed to enriching society. 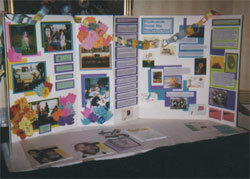 The NAMI NJ Dara Axelrod Expressive Arts Network emphasizes common interests in creative activities. These common interests include networking, outreach, advocacy and community involvement. The arts, as a common ground, provide opportunities for individuals to communicate through alternative means of expression. The strengths of individuals revealed through art activity help to form a supportive environment and relationships and/or opportunities based upon similar interests. Helping to create art resources, as well as artistic expression, is another form of active involvement. For more information about the Dara Axelrod Expressive Arts Network, email ean@naminj.org. Poetry is an expression of the soul as unique as every individual who puts the pen to paper. We at NAMI NJ Dara Axelrod Expressive Arts Poetry Program maintain that any creative expression of an individual is a poem whether it rhymes or not; whether it is one word or pages long. We have started a Poetry Corner on NAMI NJ website, with a virtual poetry workshop, monthly poetry showcase, as well as the Annual Dara Axelrod Expressive Arts Mental Health Poetry Contest which was inaugurated in April 2014. So, bring those poems out of the closet and dust them off! For more information on the Poetry Program, contact Jacquese Armstrong, Coordinator of Dara Axelrod Expressive Arts Poetry Program, at poetry@naminj.org. Art and artistic expression are an important part of healing and communicating about mental illness. “Healing through Art” was a project of Dara Axelrod Expressive Arts Network in 2015. Through the initiative and active support of Ms. Latha John, artist and gallerist, this project provided an opportunity for members of our community to express themselves through painting, collages, photography, sculpture and other media. 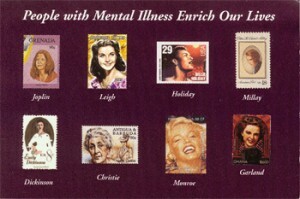 NAMI NJ has produced two postcards and a poster, designed by our own Jay Yudof, to raise awareness about mental illness. 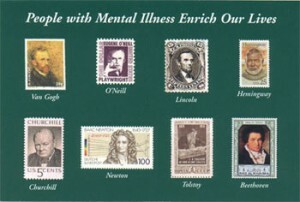 The famous people who are featured therein had experienced a major mental disorder in their lifetime and yet had contributed tremendously to society. Order some from NAMI NJ Store for your next stigma-busting event! NAMI NJ sponsored the award winning show, Hearing Voices (Speaking in Tongues), by acclaimed performer Michael Mack in October 2011. Michael Mack was five years old when his mother suffered her first psychotic break. Hearing Voices is Mack’s tribute to his mother, and a stark reminder that people with schizophrenia, including those who live homeless on the streets and whose names we may never know, are still individuals with families who love them and have a story to tell. Mack’s performance is intense, heartbreaking, funny, and heartwarming as it depicts the effects of mental illness on a family. It resonates deeply with his audiences and inspires many to share their own experiences. What you do affects others and causes a chain reaction. 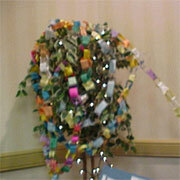 In past activities of Chain Reaction, teens and young adults were encouraged to write a positive message on a paper link that was attached to a growing chain. 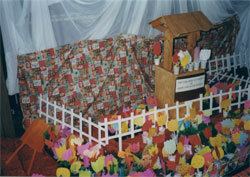 The chain would travel and be displayed at various locations and events throughout New Jersey and beyond. Being a link in a chain that communicates positive expressions of understanding and hope shows the power that individuals have in affecting others. Over 1000 links had been added to the chain. In this arts and outreach activity, children, adolescents and young adults are given the opportunity to express their Hopes and Good Wishes for their family members, friends and others due to illness or personal difficulties. In past Wall of Words activities, poets were invited to contribute copies of original poetry for use in gallery style exhibits, portable displays and outreach activities. The goal of Wall of Words is to provide an opportunity for poets who have experienced living with mental illness to include their often poignant insights alongside other artists and poets, who share the same desires to express themselves through writing and the creative arts.